One of the finest screwball comedies ever, with Grant - a dry, nervous, conventional palaeontologist - meeting up with madcap socialite Hepburn and undergoing the destruction of his career, marriage, sanity and sexual identity. The catalyst in the process is Baby, a leopard that causes chaos wherever he goes, and finally awakens Grant to the attractions of irreponsible insanity. Fast, furious and very, very funny. � Geoff Andrew, Time Out. 'What does it matter, it�s only a game,' says uncontrollable heiress Katharine Hepburn to perturbed paleontologist Cary Grant as she proceeds to wreck his car, his career, and his impending marriage in this swiftest and screwiest of screwball comedies. A wonderfully graceless Grant endures a series of Hawksian humiliations and reversals as he is tossed into a tumult of rich eccentrics, lookalike leopards, and loons of the avian and human variety - all thanks to Hepburn, as dotty as a leopard and just as dangerous, despite the supposedly civilizing effects of wealth and culture. 'Our relationship has been a series of misadventures,' Grant laments; 'everything�s going to be all right,' Hepburn repeats en route to a happy ending that is the biggest disaster of all. � Juliet Clark, Pacific Film Archive. Comedian Harold Lloyd called this the most perfectly constructed comedy he'd ever seen, and he was right. Howard Hawks directs Cary Grant and Katharine Hepburn in the screwball to end all screwballs. Grant plays a spineless zoologist who accidentally meets up with crazy heiress Hepburn at the wrong place at the wrong time. She takes a shine to him and begins to construct all kinds of wacky plans to keep him from getting married (to an ultra-conservative female scientist played by Virginia Walker). One of her plans includes a leopard named Baby. 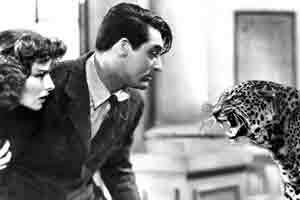 Bringing Up Baby is the fastest, craziest movie ever made. It doesn't stop or come to its senses for one second. As a result, some viewers may have a hard time grasping ahold of anything, which may explain why the movie flopped in 1938. Amazingly, the screenplay was written by Dudley Nichols (from Hagar Wilde's short story) who was known for penning some of John Ford's more somber works. Hawks made many great movies in all kinds of genres, but Bringing Up Baby is the one that seems the most like an attack on the senses. It's a brilliant movie, and one of the greatest and most intense ever made. - Jeffrey M. Anderson, Combustible Celluloid. Cary Grant can't find his bone... or perhaps it's his manhood? - Nicola Osborne, Edinburgh University Film Society.